So I figured I would explore a few things while creating in this blog, fleshing things out and maybe get some feed back. 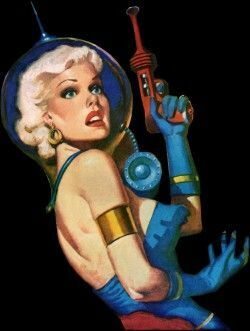 I think the first think I'd start off with is guns or "ray guns" if I am thinking of the space pulp genre, because it was always called ray guns and I may or may not stick with that, but heck let's roll with that now. Sun Ray Gun, or maybe just Sun Gun, yeah I like that a lot, "Sun Gun". The sun gun is just that, a gun that harnesses the energy of the sunlight and channels it inside this gun. The gun then takes this energy and turns it into a laser like blast. Each gun will hold 6 charges and each charge holds 3 shots. The user of the weapon must spend one round turning the dial on the gun to load another charge. To recharge the gun, the owner must leave the gun out in direct sunlight to absorb the energies for at least 1 hour undisturbed. For some reason I see the gun looking a lot like this picture below with that piece at the end before the barrel of the gun, the part you'd twist. Just a work in progress for things I am thinking about. Anyone have thoughts about this?